Biggest game of the year upcoming. 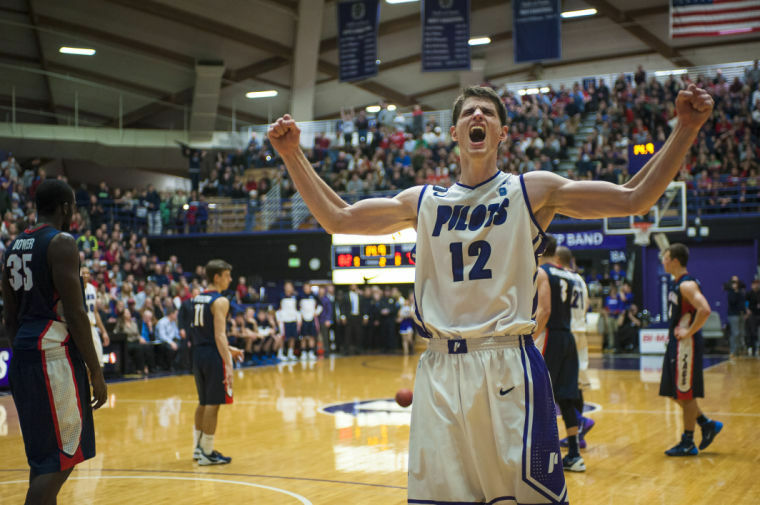 A loss for the Pilots would put an end to a monumentally disappointing finish to the season. I've thought the team has adjusted and actually played well in three of the four games since Wintering was hurt, but it was always going to be a difficult road trip to end the year and the injuries made it even harder. This team misses Wintering and Bailey something fierce, but it's also been fun to watch Barker and van der Mars work together down low despite some "missed opportunities" on the road. Looking forward to a W on Thursday. Does anybody know if the game will be aired at BWW? Will any of the usual suspects be there to watch? I've only been to BWW a couple times, so I doubt that makes me a usual suspect. However, I think I will be there. I just heard Reveno on John Canzano's radio show. Sounds like both Alec and Kevin are very doubtful for Thursday. Godwin and Deji are starting PF and SG were in car accident at start of season. Godwin out for year, Deji came back but injured his hip two games into season and was out for year. Patson a great center had to red shirt this year. Ben Dickenson left team for personal reason after the Portland game down here and hasn't been back. Two of our walk-ons are also injured. Recently our starting PF freshman Gabe Levin had concussion...hoping he will be ready for Thursday. 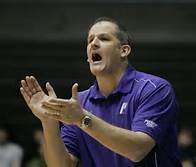 Despite only having 7 guys, Coach Good has the team playing hard...we beat Santa Clara and put up a fight against USF. Wow... that's brutal. It seems like LMU has had way more than their share of injuries/player shortages the past few seasons. Even with only 6-7 players, one of them is Ireland, and no one takes that lightly. We expect a heck of a game on Thursday! So if Wintering and Bailey are "very doubtful" (based on BlackSheep's comment), I guess we wont know anything for certain until we see if they are dressed for the game or not... but Rev's response is a departure from the previous "day to day" and that Bailey's injury was worse. I asked the question about BWW for tourney games... I will let you know what I hear. As a journalist would say "sources within the University" have confirmed that there will be official watch parties at the Lloyd Center Buffalo Wild Wings for all Men's games for the WCC Tournament! I am thinking I will head over there on Thursday, since I was over-confident and booked my flight to Vegas for Saturday morning! 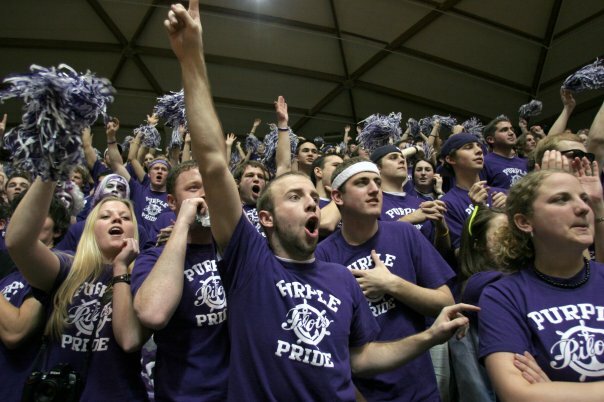 It would be great to get a purple crowd there. The Blazers are off on Thursday, so hopefully we can get the audio! Ironlions that is quite an injury report and I am sorry for the losses that the LMU team has endured. Max is one of the good guys. I know he gets a lot of flack over at your board but I have never heard anything but good things from those close to the program. He can recruit and manages the game fairly wel from the sidelines. I hope to see a good game on Thursday, wish I could say good luck but as we both know we want our respective teams to win. The Las Vegas odds makers will have something up tomorrow....but remember, for those of you who are in Las Vegas and want to actually place a bet, you will have to do it someplace other than the Orleans Hotel/Casino/Arena....I'm not sure who's rule it is that prohibits it, but the Palms is not too far away. Pretty sure it is part of the WCC-NCAA contract. Thanks Oldtimer- our board has been so toxic I stopped going. We have had a lot of injuries over the past few season but this year is a doozy. I'm looking forward to the game on Thursday. Pilots bigs are going to be very hard for us to handle. IronLions wrote: Thanks Oldtimer- our board has been so toxic I stopped going. We have had a lot of injuries over the past few season but this year is a doozy. I'm looking forward to the game on Thursday. Pilots bigs are going to be very hard for us to handle. We would like to wish you luck, but we remember last year. PurpleGeezer wrote: We would like to wish you luck, but we remember last year. It's tournament time! I woke up feeling good about tonight... let's hope the mojo is being felt in Vegas, too! 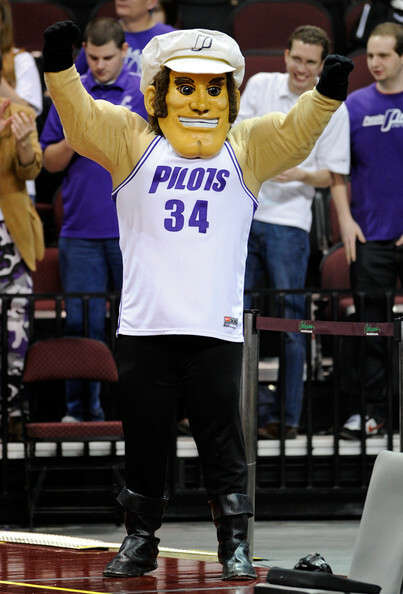 I just want to see more Pilots basketball this season. I want to see them get another shot at BYU. I want to see Ryan Nicholas and Korey Thieleke go out feeling that they and their team lived up to their potential. I want to see some magic at the Orleans. I'm not ready for this season to end. Go Pilots! This is the best fan shot of all time. I heard that guy who's front and center made the trip to Vegas this year. I heard he finally got that GPS ankle cuff off. Just love these substitution patterns. Way to get a real game flow...SERIOUSLY! Glad to see you are happy. We sure do miss Wintering. With all the turnovers and offensive stagnation, this offense looks like last year's... which is NOT good. 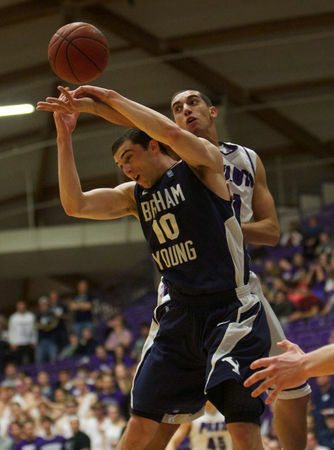 Announcers on BYUtv again commenting on Pilots "standing around" on offense. Oh I'm really happy with our continuing lower division standings. Tell me how we can't even win CIT first round game or finish in the top half of our conference after 8 years? Just asking, enlighten me! We are up by 13. They are in foul trouble. Tell me again about the substitution pattern you are ecstatic about. Travel on Carr is the worst call of the year. That was a terrible travel call on Carr. Are you serious?